Our 2 day tour of St. Petersburg far exceeded our expectations. Our tour guide Lisa with an s was the best guide that we have ever had. A full schedule that we completed without feeling rushed and a great experience overall. Victoria's knowledge of everything was not only incredible but extremely interesting making our experience to this port life changing for me. I want to know more and wish we had more time. Her management of time was impeccable and her driver was a perfect compliment. I would recommend her to all. Amazing place and an amazing tour guide. Great tour. We were met by a tour guide Maria and driver Sergey first day, though it took some time to go through the Russian Customs about 40-45 min. We had comfortable minivan Mercedes with A/C, Wi-Fi and water. First day was from 8:30 to 6:30 and 2nd day 7:50 to 5:30. We did see everything was promised in the itinerary, we had great lunch in a very nice and clean restaurants. Tour guide, Maria speaks perfect English, very attentive and tries to show as much as possible and answer all the questions. We were taken to Hermitage on the day this beautiful museum was officially closed and had practically no crowds, we did see beautiful Petergoph fountains I wish we go inside and see at least a few royal rooms, though., However, we were taken to Catherine's Palace and saw famous Amber room. Very impressive!!!. St. Petersburg was my favorite place to see from the Baltic Cruise. It will stay in my memory forever. 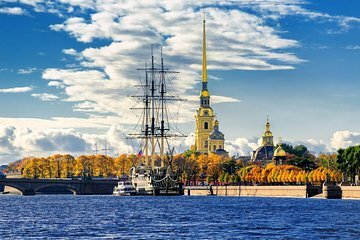 I believe St. Petersburg is a must see city for everyone!! Thank you TJ Travel, Maria and Sergey for a great time! This is a great tour, by a well organised company. I highly recommend this tour - it was far superior and much more reasonably priced than the ship tours. The small group meant less time queuing, less time waiting, more sites visited and a much richer, fuller experience. Nina was our guide and Ivan our driver - both were very professional. Nina's knowledge of St Petersburg history, architecture and culture is amazing. She is enthusiastic and obviously loves St Petersburg and tour guiding. With her great organisational skills and vast experience with the itinerary she was able to keep us all on schedule, without feeling rushed, so that we could see everything on the itinerary - and with St Petersburg's traffic that is not easy. Ivan's driving is amazing and even in the chaotic traffic we felt completely safe while he navigated through traffic jambs. The itinerary included all the most significant sites of St Petersburg that can be seen in two days - and combined with Nina's fantastic information we learned more, and appreciated more, of St Petersburg than we thought possible. The tour company was running many tours from our ship in St Petersburg - everyone in our van was from the same country- we were all introduced to each other and had a great two days together. The van was modern, clean and well maintained. Access to the internet was great. The two souvenir shops we visited, while reasonably expensive, had a great variety of good quality merchandise - I wanted some souvenirs and didn't want to spend too much time out of a tight schedule to do this, so it suited me well. The two restaurants visited were interesting and I enjoyed the food. The only criticism is that I would have loved to buy a glass of wine with each meal, but it was just too difficult to negotiate.